Large or small, beaded earrings can be eye-catching and dramatic. Use these three, free beaded earring patterns to create some of your own. If you need help downloading any of the patterns, check out these helpful tips. These long, dangling earrings are wrapped with wire to give them greater interest and depth. Cut a piece of wire approximately 2-1/2-inches long. 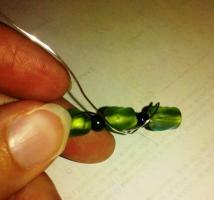 Use jewelry pliers to bend one end of the wire into a small loop to prevent the beads from sliding off. 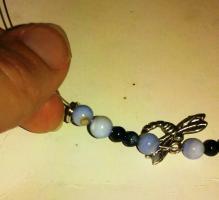 Slide on a glass bead, followed by a stone bead and alternate until all beads have been used. 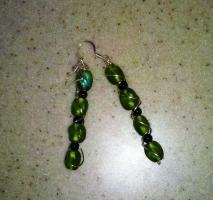 Slide an earring hook onto the end of the wire and push it down against the beads. Wrap the left over end of the wire around itself to secure. Cut a second piece of wire approximately 5-inches long. Wrap one end of this piece of wire around the top of the earring, just beneath the hook. 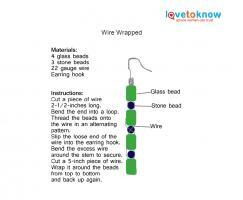 Loosely wrap the rest of the wire around the beads, traveling down to the end bead. When you reach the end, reverse direction and keep wrapping until you reach the top of the earring. Secure the end of the wire around the top of the earring. Dangle your choice of charm from the bottom of these circular earrings. Add additional beads to these to make the pattern larger. Cut a piece of wire approximately 2-inches in length. Bend one end of the wire into a small loop. The loop should be just big enough to insert the other end of the wire through. Thread two mother of pearl beads, followed by two stone beads onto the wire. 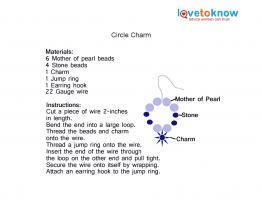 Thread one more mother of pearl bead, then the charm onto the wire. Finish with one more mother of pearl bead, followed by two stone beads and two mother of pearl beads. Thread a jump ring onto the end of the wire. Take the loose end of the remaining wire and thread it through the loop you made in the beginning. Pull the loose wire tight to close the earring into a circle. Wrap the excess wire around itself once to secure. Insert the end of an earring hook onto the jump ring. 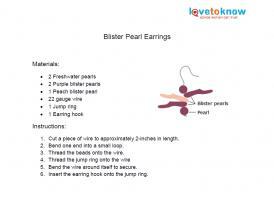 Blister pearls have an earthy beauty with their irregular shapes and sizes. Combine them in different colors with freshwater colored pearls for some unique earrings. Cut a piece of wire approximately 2-inches long. Bend one end into a small loop to prevent the beads from falling off. Thread one freshwater pearl, followed by one purple blister onto the wire. 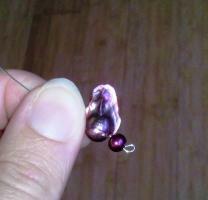 Thread the peach blister, followed by the remaining purple blister and the freshwater pearl onto the wire. Thread a jump ring onto the wire and bend the wire around itself to secure. Cut off any excess. Attach an earring hook to the jump ring. With the number of beads and patterns available, you're sure to create some unique and personal earring designs. Use these tips to help make whatever pattern you use a success. Your earrings won't be comfortable to wear if you use heavy wire or heavy beads. Look for lightweight materials like hollow glass beads or very small stone beads to minimize the weight. Keep the wire gauge as high as possible or use beading thread to further minimize the weight of the earrings. 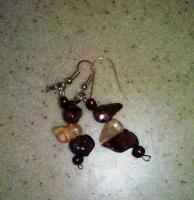 Take any beaded earring pattern and make it your own by changing the size and shape of the beads being used. Try reversing the sizes listed to keep the overall size of the earring the same, or consider making miniature versions of the same pattern by using tiny beads throughout. If you choose to use wire to make your beaded earrings, remember that wire ends can be sharp, and extremely uncomfortable if they bump into the delicate skin next to your ear or neck. To prevent a scratchy earring, always bend the ends of the wire into the earring, so only the softer, rounded edge of the wire will touch you. Earrings that don't have sufficient space between the beads and the hook may land in awkward positions when worn, so always provide enough space for movement. 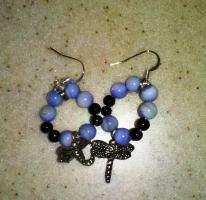 Making your own beaded earrings can be the jumping off point to making a whole line of custom jewelry. 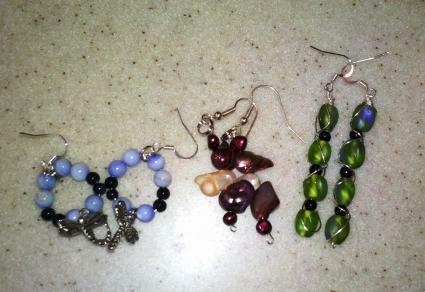 Try these free beaded earring patterns to start with, and then play with your own designs and see where they take you.